The media giant is struggling to find an audience for its cable TV content, and ad sales are plunging as a direct result. This could be the canary in Viacom's coal mine. 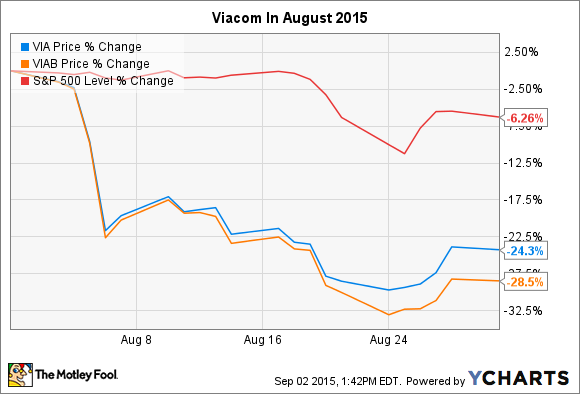 What: Non-voting class B shares of Viacom (NASDAQ:VIA) (NASDAQ:VIAB) fell 28.5% in August, according to data from S&P Capital IQ. The voting stock, traded as Class A shares, dropped 24.3%. Year to date, both share classes of the media giant have fallen more than 40%. So what: Viacom mainly followed the general market lower in August, with the notable exception of an additional 22% plunge, powered by a disappointing third-quarter report. The third quarter wasn't an unmitigated disaster, as Viacom missed Wall Street's revenue targets while exceeding analysts' earnings projections. However, the sales miss stemmed from a very troubling trend in the underlying business mix. Now what: Thanks to increased affiliate fees, Viacom nearly made up for disappointing ad sales across its cable TV networks. Not quite, but almost: Analysts expected total company sales of $3.3 billion, and Viacom could only muster $3.1 billion. Media networks ad sales fell 9% year over year, balanced out by an equally sized increase in affiliate license charges. In a perfect world, these two revenue streams would walk hand in hand, as strong ad sales would rest on powerful viewership trends, thus supporting higher fees charged to cable and satellite networks that want to carry these successful channels. But Viacom's viewership is falling, dragging ad sales along for the ride. The affiliate fee increases seen in this report come from contracts signed in happier times, when Viacom stations, such as MTV and Nickelodeon, had the power to attract consumer eyeballs on a regular basis. MTV's prime-time ratings are down 22% year over year, and dropping even faster in the crucial demographic of 18-to-34-year-olds. Digital media has started cutting into Viacom's most profitable operations, and the company is desperately seeking new ways to sell its ad space without leaning on audience ratings. If these efforts fail, you can bet that the positive affiliate fee trends will turn around in short order, following the declining ad revenues down. The year 2015 is turning into a difficult one for Viacom. I'm not at all sure that the pain will stop anytime soon.